I literally started this soup at 5 p.m. and app. one hour later I was eating it. Now that’s always a good thing in my book. Usually I slow cook my broth etc. and it takes hours ( Homemade Chicken Soup ) but this time there was no time, I wasn’t feeling great and wanted that homemade flavor without all the work . You can certainly cook your own chicken if it works out for you time wise. This would also be perfect with leftover chicken. I bought a rotisserie chicken and this is what I did. For those of you who saw it on Instagram and Facebook–this one’s for you. One more little thing, the fresh dill is the secret ingredient and gives it that wonderful layer of flavor, don’t skip it. I also squeezed fresh lemon into each bowl of soup , this added yet another wonderful layer of flavor to this soup. This is also a fairly low-calorie soup because whole soup is made with only 1/2 cup of orzo and it was plenty. I used these vegetables this time but feel free to add parsnips, mushrooms, kale or any other veggies you like. 1 Rotisserie Chicken, skin removed and shredded . 2 large carrots cut into 1/2″ rounds. I found beautiful organic baby carrots and used them, it’s about 2 large carrots but feel free to use a little more or less. 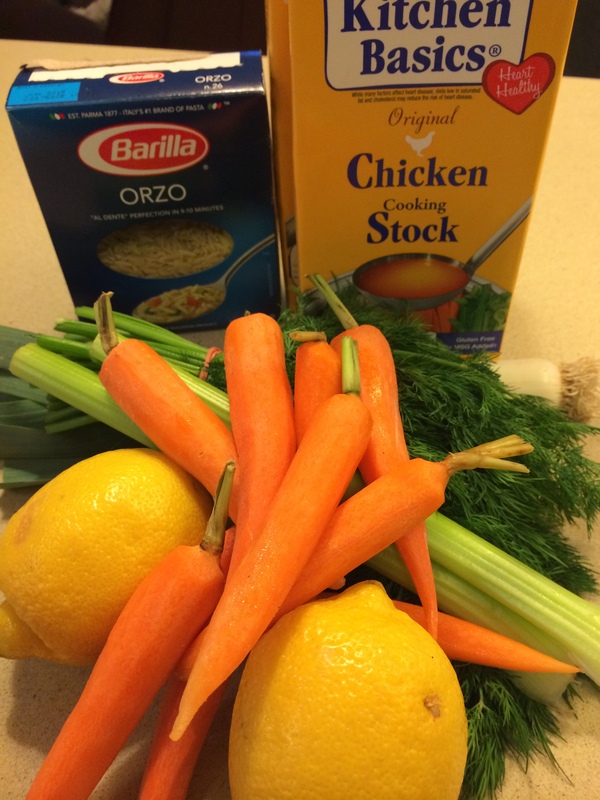 6 – 8 cups chicken broth, if you have homemade broth/stock good for you and use it. If not the box ones are awesome. Low-Sodium is good here if you’re concerned about the salt. Heat olive oil in a large heavy pot over medium heat. Add the leek, celery and carrots. Cook veggies, stirring often, until vegetables are soft, 10-15 minutes. I threw a little salt and pepper in to vegetables during this period, you can taste for salt and pepper again. 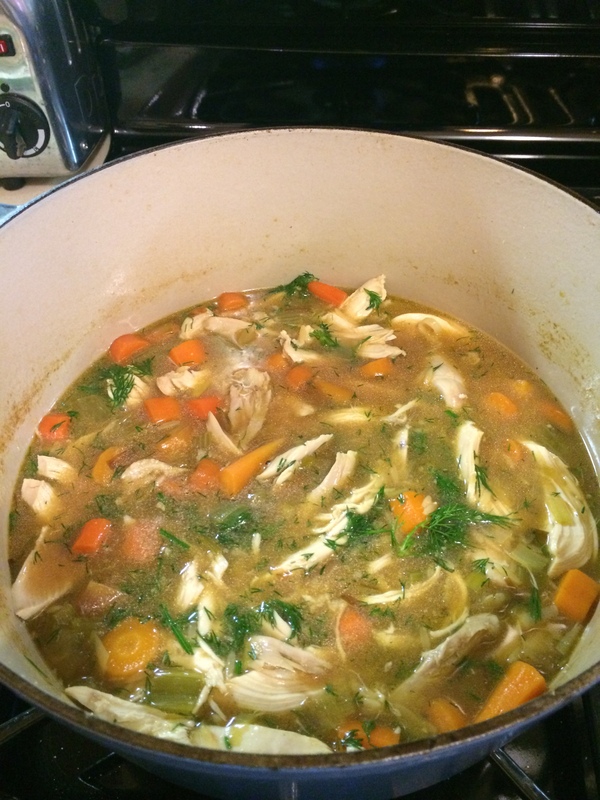 Add 6 cups of chicken broth and bring to a boil. Then lower to a simmer for about 20 minutes, just till carrots are soft. After about 20 minutes, I added 1/2 cup of orzo and cooked for 8- 10 minutes. Taste for Salt and Pepper. 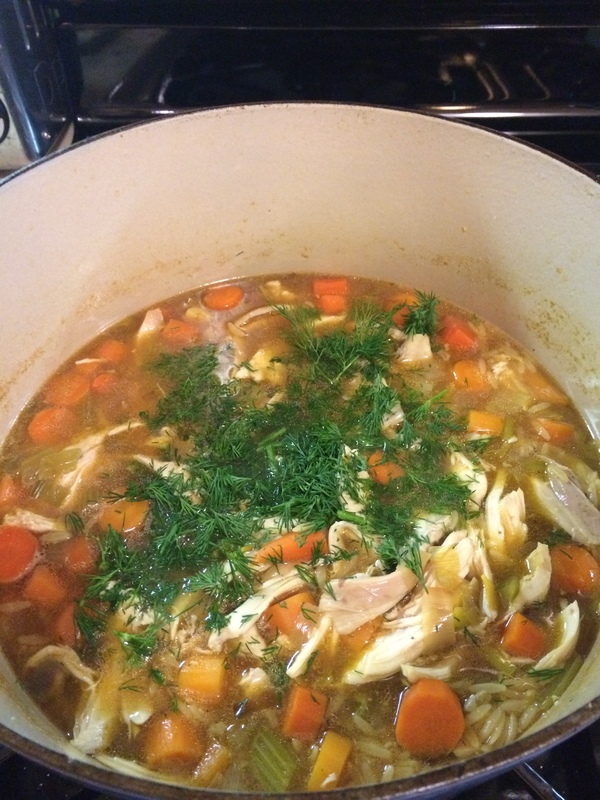 I then added the shredded chicken and dill and I also added a bit more of the chicken stock at this point since broth cooked down a bit. I heated soup a bit more and served with lemon halves, squeezing a bit of lemon into each bowl of chicken soup before serving. I literally started this soup at 5 p.m. and app. one hour later I was eating it. Now that’s always a good thing in my book. Usually I slow cook my broth etc. and it takes hours ( Homemade Chicken Soup ) but this time there was no time, I wasn’t feeling like cooking my soup for hours and wanted that homemade flavor without all the work . You can certainly cook your own chicken if it works out for you time wise. This would also be perfect with leftover chicken. I bought a rotisserie chicken and this is what I did. For those of you who saw it on Instagram and Facebook–this one’s for you. One more little thing, the fresh dill is the secret ingredient and gives it that wonderful layer of flavor, don’t skip it. I also squeezed fresh lemon into each bowl of soup , this added yet another wonderful layer of flavor to this soup. This is also a fairly low-calorie soup because the whole soup is made with only 1/2 cup of orzo and it was plenty. I used these vegetables this time but feel free to add parsnips, mushrooms, kale or any other veggies you like.